We’d love your help. Let us know what’s wrong with this preview of The Withering Banyan by Hyma Goparaju. A well-to-do business family, whose members are torn apart by a turbulent father-son relationship shrouded in mistrust, suspicion, and contempt for one another – a result of the vagaries of the son's mind and its maladies – suffers silently. Well-wishers fear that Badri is suffering from a mental derangement, and is on the brink of wiping away his father, Siveswara's hard-earned fame and fortune. Unaware of the boundless periphery of its affliction, descendants of the five-generation lineage are confounded with an enigmatic and stigmatizing battle of their lifetime which they have to decode and overcome in order to ensure the well-being of the ensuing generations. To ask other readers questions about The Withering Banyan, please sign up. Congratulations For ur debut book and Thanks to Author Paradise for counting me in your "Reviewer List"
I conducted a survey in my family to know how many of them are stress free or never felt lonely ?? Or how many believes that a person visiting a Psychiatrist is a total nut case and how many think its like "Defaming the families prestige and legacy"
:-The legal system which is suppose to stand for the truth and righteousness is actually chained by stronger corrupted bodies so where are we leading to ? :- They dominate the women-folk, ensure that they marry as soon as they inch their teens,ill-treat the sick, back-bite and fight for every bit of property so is that Indian families and societies all about ?? :- Human Mind has a gulf between sanity and insanity.Those who land accidentally in such zone are unwanted by either sides and so are the doomed for ever ?? But has the humanity got the humaneness to take custody of such lost identities ? A look into the modern Indian English fiction every now and then brings an apprehension about the quality of Indian English novels at the present time. While a number of novels are published every year, a large number of these disappoint you or do not leave any sort of impression on you. However, there are moments in life when one is grateful for giving you a ray of hope. And, surely reading ‘The Withering Banyan’ by Hyma Goparaju was one such moment for me. The rhythmic but powerful voice in th A look into the modern Indian English fiction every now and then brings an apprehension about the quality of Indian English novels at the present time. While a number of novels are published every year, a large number of these disappoint you or do not leave any sort of impression on you. However, there are moments in life when one is grateful for giving you a ray of hope. And, surely reading ‘The Withering Banyan’ by Hyma Goparaju was one such moment for me. The rhythmic but powerful voice in this novel not only shows a promise, but also successfully depicts the struggle of people suffering from a severe brain disorder known as schizophrenia. This disease is distressing not only to the patient but also to the people related to the patient. This disease often remains undiagnosed and the patient does not get the right treatment at the right time. On top of that, various types of myths attached to this disease make the life of the person suffering from this disease a real hell. This is what forms the chief motif in this novel. ‘The Withering Banyan’ is the story of a family in which a number of its members are suffering from schizophrenia. The plot basically deals with the consequences of the ignorance of this disease leading to the sufferings of the patients. At the same time, this book is not all about schizophrenia. It is also about the values and drawbacks of a compound family. The plot tries to explore the intricacies of relationships within a family. The story moves in between past and present, and credit should be given to the author who has handled the shifting surfaces of past and present with extraordinary fineness and delicacy. The banyan tree which constitutes the title of the book has been added in the narrative not only as a symbol but also as suggestive additions. This symbolism of banyan tree adds a solid dimension to the well-woven storyline. As for the narrative technique, Hyma Goparaju is endowed with an unerring sense of situation and with the ability to visualize a scene clearly. The author has created a realistic narrative of South Indian life. Her range is wider as this work exhibits greater variety of mood and tone. At the same time, occasionally you feel that the story is dragged unnecessarily and ink could have been saved by staying away from describing same things over and over again. There is no doubt that repetition can be a useful device in fiction if used logically. However, the repetitions in this book are obviously not of that type. While a number of English novels by Indian English writers have skated nimbly and charmingly over the theme of mental disorders and their implications, the sensibility and form of the language generally show a typical Western point of reference. I am happy to say that with its purely Indian receptivity and sensibility standing on the age-old Indian soil ‘The Withering Banyan’ stands tall among other novels like a Himalaya among pretty little hillocks. By virtue of its range and depth, its complexity, subtlety and maturity, I will take this novel as a dazzling performance by any fictional standard. This story revolves around the story of a family whose most of the members are suffering from brain disorder which is genetically transferred.. in this disease people can easily interpret reality, in an abnormal manner..this book is basically written keeping in mind all the pros and cons of this disease and how mari family dealt with the situations..one of the member of this family was affected by this very same disease and the whole family started getting effective in continuity, which hampered This story revolves around the story of a family whose most of the members are suffering from brain disorder which is genetically transferred.. in this disease people can easily interpret reality, in an abnormal manner..this book is basically written keeping in mind all the pros and cons of this disease and how mari family dealt with the situations..one of the member of this family was affected by this very same disease and the whole family started getting effective in continuity, which hampered their personal lifes and as well as their professional life..what happens next? What all mari family has in store for you? What relation mari family possess with the banyan tree? Read this intriguing and amazing story to find out all the answers..
Hyma has beautifully portrayed the story and i m sure it will keep you hooked from the beginning till the end .. experiences of life have been keenly observed and penned down, narration is simple yet quirky..each and every character has been justified properly, what i liked is the description of each and every generation.. Readers will definitely love the poems at the end of the chapters..
What i feel is hyma has added characters and has described the same things and incidents 'n' no of times which makes the book quite boring.. Unnecessary importance was given to the 5 kids of badri, earlier the author mentioned that he had 8 kids, incidents and for that matters number could have been decreased..! Hyma has done a wonderful job by writing about a disease which everyone is unaware of..usually people make fun of lunatic and people of insane minds, they never look at the reason behind it, we can term it a lack of awareness and reasoning.. Author had done a commendable job by choosing such an exceptional topic and has added stars by writing about it, by adding spices of spiritual beliefs, family drama and the beliefs what society holds in their mind..one can simply take this copy to enjoy such mindblowing exceptionally wow journey of withering banyan.. The story is divided into two parts, one dealing with the present and other dealing with the past. The Withering Banyan is the story of Marri Family in which many of the members are suffering with a genetically transferred brain disorder, Schizophrenia, in which people interpret reality abnormally, hallucinate and stay isolated. One of the members of this family got affected by it and the rest of the four generations inherit it from him. Till the four older generations, people preferred naming it madness and ignored consulting Psychiatric treatment. The book dealt with the consequences of this ignorance and the sufferings the patients had to undergo while they were in their dark phase along with its effect on their family and business. But till this disorder reaches its fourth and fifth generation, Natya grand-daughter of Marri family whose mother also died suffering from this disorder direct all her efforts towards awaking her extended family about the causes of abnormal behaviors of many of the present generation members. Together with this, it also deals with other problems that are associated with Indian families and society. Will Natya be able to solve their problems and remove that ‘mad’ tag from her family? What lessons Marri-family-drama has in store for you? What is the relation of this family with the banyan tree? Read this enthralling story to find out all the answers. The experience Hyma have of life and English language is clearly visible in her book since a wonderful vocabulary is been used by her in the entire book. The narration is kept simple. A good use of literature is done in most of the aspects of the book. Proper justification is given to all the five generations and each and every character discussing all the aspects right from all the necessary births to deaths. Also, the time period of each and every generation is precisely planned and mentioned which include pre-independence, post-independence and present day descriptive. The book cover and title perfectly match with the theme and content present in the book. First chapter is outstandingly penned and is enough for arousing readers’ curiosity in the book. Also, the last chapter has left a nice impact with a perfect ending. Another wonderful part of the book was the small poems describing characters’ state of mind in the ending chapters. And that is why I never cried. Human minds are also the same, uncle. Chained minds refuse to explore or grow and continue to delve in the darkness of the suffocating spaces. Very few have the courage to split apart the chains and step out. With this book, she has perfectly penned the problems associated with Indian families, eve teasing and the slow-paced judicial system of India. A small story has been stretched too much which will ultimately make it a bit tiring read after half book completion. Besides that, I felt that some more amount of description for Schizophrenia and its symptoms, aftereffects of the disorder should have been added to clear all the doubts of readers on this disorder. Some unnecessary incidents are described too much which could have been cut short to decrease the length of the book. Also, only five kids of Badri were given importance in the book when it was previously mentioned that he had eight kids. The number could have been decreased for this matter. I think this is a wonderful initiative taken by Hyma to discuss a brain disorder about which the people of our country are still unaware of. It is easy to call someone “mad”, “lunatic”, or “insane” after noticing him/her for a while but we never think about what they go through in that state. Also, if someone is seeking Psychiatric help on such issues, he/she is tagged with the title ‘insane’ by the society which is again a result of lack of awareness and understanding about such delicate issues. After reading about a number of psychological-disorder-stories including Bipolar disorder, OCD and now Schizophrenia, what I have concluded is that we people will certainly go to a doctor if suffering from cold, cough, fever, jaundice, TB or any such diseases but seeking medical help for mental ailments is still not common that that will bring you under the tag of ‘madness’ in the eyes of the society. Taking help of a story to weave understanding about such an issue is an exceptional task performed by the author and my heartiest wishes are with her for bringing light to it. A perfect amalgam of societal beliefs, family drama and a strong will to bring changes, grab your copy of The Withering banyan to dive into this mind changing journey. A well-to-do business family, whose members are torn apart by a turbulent father-son relationship shrouded in mistrust, suspicion, and contempt for one another- a result of the vagaries of the son's mind and its maladies - suffers silently. Well-wishers fear that Badri is suffering from a mental derangement, and is on the brink of wiping away his father, Siveswara's hard-earned fame and fortune. Unaware of the boundless periphery of its affliction, descendants of the five-generation lineage are confounded with an enigmatic and stigmatizing battle of their lifetime which they have to decode and overcome in order to ensure the well-being of the ensuing generations. The story has been set up in two parts. One part tells the story of Badri, son of a rich father Siveswara and mother Parvathy Devi. Badri is very much attached to his grandmother Kanakamma. They have a business of sweatmeat known as Irram House which is growing faster and bigger. Their house, which is popularly known as Marri House is the only palace like house in the whole town. The hiuse has a Banyan tree which is considered as their goodwill. When Badri grows up he oppose joining father's business instead open ups his own press known as The People's Herals with his childhood friend Sundar, which didn't do well. Due to many problems and loss of dear ones, Badri starts loosing his self control and become aggressive with time. The second part describes how Badri's granddaughter Natya comes to India from Australia after the death of her mother. Badri registers the big Marri house on the name of Natya's mother. To which all his other children were not happy and they took the matter to the court, proving their father mentally retard. Schizophrenia runs in the family and has affected many people. The author has keenly observed the behaviour of the relatives. Now-a-days relatives are becoming selfish. All they consider is property and not relations. Author has compared the withering Banyan with the withering families, hence the title is appropriate. The story shows the true side of relations and it is well written. Everything is well explained, but I felt that author has used many difficult words which compels readers to open dictionary at every sentence. I feel in that way, readers pay more attention on dictionary and less on the story. Overall it was an amazing read. The story begins with a frightening incident where Natya’s mother smashes a large mirror and talks about killing a wicked woman. She is suffering from Schizophrenia. Natya is the daughter of Shraddha Devi who comes from the Marri family. The Marri family which is popular by the name Irram Sweet Makers was considered the best in the village. The fame of Irram Sweet House kept diminishing after the death of Natya’s great grandfather, Siveswara. Lack of proper funds and interest in business led to its downfall. Natya is in India to give justice to her mother by inheriting the Irram Mansion. Natya’s relatives are against it and are making false allegations so that she returns empty handed. Siveswara was blessed by a son whom he called Badri (Natya’s grandfather). Badri was a pampered child. He was average in studies until the day he met Sundar. Sundar was an intelligent fellow and very soon, he became a role model to Badri. Badri was a rebel. He hated the customs and traditions of our country. It is his rebellious nature that forced him to go against his father and start up his newspaper ‘The People’s Herald’. Widow re-marriages was not appreciate during those times. Badri challenged the society by marrying Swarnamati. Badri’s orthodox parents did not accept Swarnamati as their daughter-in-law at first. With time, they slowly began growing an opinion that she was the perfect match for Badri. They say happiness and sadness are both a part of our lives. An incident occurred in Badri’s life which changed him altogether. What incident was it? What changes took place? Is Natya’s visit to India a successful one? What does she learn about her maternal family in India? Transition from past to present and vice versa. Each chapter is linked to the next one in some way. Hence reading is smooth without any scope for confusions. Schizophrenic people are not mad. Our society needs to know this. Natya’s stand to get Pranati married to Sameer. The narration style of the author is excellent. Not even once, I lost the track of the incidents that are narrated in the novel. They are perfectly woven. I learnt many new words (I had to resort to dictionary to find its meaning) and they enhanced my vocabulary. 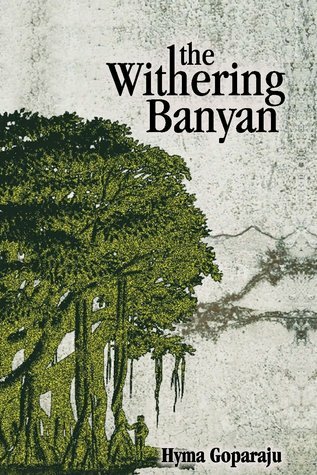 The Withering Banyan is a one-time read. Then title and book cover matches with the theme and content of the book. Language and Literature of the book is greatest strength of the book. Book shows us the Hyma ma'am love towards literature. The Withering Banyan is narrated in two parts, present and past which emerges at the end making the end perfect. First chapter is written so well that it increase enthusiasm of the reader to read the next chapters. Narration is simple and attractive. The negative thing of the book is additional description of certain events. Use of adjectives and adverbs in the dialogues. More description about the Schizophrenia would have avoided confusion. So The Withering Banyan is new story with new concept with amazing literature. You can grab your copy from Amazon Flipkart or nearby book store. The withering banyan is a tale of rise of one Marri family to affluence and its gradual fall due to Schizophrenia – a brain disorder genetically passed along its four generations, which the members ignorantly interpret as madness, till Natya, the granddaughter of the Marri family, comes to the rescue of the family. The tone of the prose is biographical. And the precise, elegant, and graceful writing of the author has nicely managed to convey the story. Also the author’s love for the language is c The withering banyan is a tale of rise of one Marri family to affluence and its gradual fall due to Schizophrenia – a brain disorder genetically passed along its four generations, which the members ignorantly interpret as madness, till Natya, the granddaughter of the Marri family, comes to the rescue of the family. The tone of the prose is biographical. And the precise, elegant, and graceful writing of the author has nicely managed to convey the story. Also the author’s love for the language is clearly evident on the paper. In fact, I found the language as one of the greatest strength of the book. However, at times the author has gone out of the way to describe things in detail, which derails the momentum of the central theme. Also too many adverbs and adjectives have been used to describe the dialogue of the characters, where even if you pick only the dialogue and discard its description, you don’t lose the meaning of the story. But I highly liked the way the author has narrated the story, where alternate chapters have been dedicated to carry forward two stories – one of the past, and other of the present – to finally converge at the end to complete the story. It was an interesting read. The story was good. The language was excellent. But I feel that the same could have been said in fewer pages.
" the Withering Banyan" by Hyma Goparaju ... few of days back I finished reading it ... and its really wonderful one with very interesting story, with an important social subject "schizophrenia" ..... and the other importantance of this book is ...she narrates the story in an exceptional manner that it creats intrest chapter by chapter till last 38.... with inclosure of lots and lots of much information of many things... we wish her heart fully to have many more from her pen. I sincerely thank the author Hyma Goparaju for sending me a copy through Goodreads giveaways.It's an interesting novel with awareness towards the mental disorders etc.The story also guides us through the developmental thought process of youth in those days.Schizophrenia was well explained.My English vocabulary also stepped up a higher by this novel.It's a wonderful read.I thank the author once again. This book is a perfect example of Social and Domestic Novel. First of all, I loved it as it is a full length novel. It is beautifully written and the aroma of words makes you nostalgic. The plot is really strong and the way characters are dealt is impeccable. Natya and Badri are the main protagonists and the story keeps you glued and yes, it takes time but after reading you end up with a big smile. The title fantastically justify the thought process of the novel.